MACKINAC ISLAND, Mich. -- If General Motors wants to stay at Detroits Renaissance Center, itll have a powerful new tax incentive to work with. Wayne County Executive Robert Ficano and Detroit Mayor Dave Bing announced today at business conference here that theyll offer GM the tax breaks that come with a "renaissance zone" designation to stay in Detroit. CEO Fritz Henderson rattled local political leaders on May 11 by saying GM is open to considering moving its headquarters as it explores ways to slash costs. 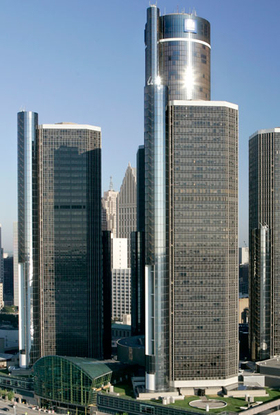 GM purchased the glass-towered building last year for $625 million and has called the downtown complex home since 1996. A goal of the renaissance zone designation is to enable GM to consolidate, according to a Wayne County press release. The incentives, Ficano said, will not be available just to GM but to any business that wants space at the Ren Cen. A renaissance zone is a powerful tax abatement tool. In a renaissance zone, a host of taxes are waived, including business, income, and real and personal property taxes. Ficano said the designation would last 12 to 15 years. He said Wayne County and Bings team worked rapidly to put the deal together. If youre going to consolidate anywhere in the world, you can now come here, because you are going to get tremendous tax breaks, Ficano said. One tower not owned by GM is occupied by computing giant EDS Corp. and already has a renaissance zone. Four other towers would now also be in a renaissance zone.